Get your kids into diving with the Rebel Kids BCD. Fully adjustable, it will keep fitting for years as your child grows. Durable 420 denier nylon construction means it’ll handle anything thrown at it. The backpack is padded to provide a cushion when wearing a tank. Two quick release clips on each shoulder strap allows you to adjust the length of the shoulder straps while the large Velcro cummerbund makes getting the fit at the waist easy. Combined, these ensure the Rebel Kids BCD will comfortably fit your child for years. A balanced inflator and three dump valves placed around the BCD ensure getting perfect buoyancy is painless and simple. Zippered cargo pockets and plastic D-Rings provide lots of space for carrying and storing extra gear. Lightweight - The Rebel Kids BCD weighs only 2.59kg making it ideal for travelling. Tough and Durable Construction - This BCD is made from light and wear-resistant 420 denier nylon. The material is long-lasting and is one of the features which makes the Rebel BCD so lightweight. One Size Fits all - The Scubapro Rebel Kids BCD features a variety of clips and adjustable straps meaning you can expand the fit as your child grows so it’ll be suitable for years to come. 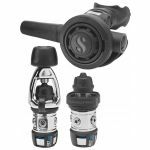 Easy Buoyancy Control - A balanced inflator and three dump valves placed around the BCD ensure getting perfect buoyancy is painless and simple. Adaptable Sternum Strap and Cummerbund - Adaptable sternum strap and cummerbund allow for a comfortable fit, even as your child grows. Padded Backpack - Padded backpack provides extra cushion when strapped to a tank for greater comfort. Tank Webbing - Lightweight webbing fits around your tank to keep it secure when diving. Balanced inflator and three dump valves allow for pinpoint buoyancy control. Zippered Pockets - Two zippered cargo pockets and three plastic D-rings provide lots of opportunities for carrying extra gear. Who is the Scubapro Rebel BCD for? The Rebel is one of the best BCD’s around for kids. Feature packed, it’s designed to grow as they do and keep fitting comfortably. Easy to use and hard wearing the Rebel BCD will provide years of enjoyment for you and your child in dives all around the world.